Timothy R. Hyland is a Senior Member in the Phoenix office of The Cavanagh Law Firm, P.A. He has been representing the insurance industry in complex insurance coverage and litigation matters for thirty years. He has extensive experience in the analysis and litigation of complex insurance claims and coverage in both the first-party and third-party contexts. Mr. Hyland’s practice involves many lines of insurance including automobile, property, general liability, professional responsibility, life, health and disability. Tim’s practice also includes substantial commercial business and personal injury matters for businesses and individuals. Tim has litigated matters involving wrongful death, trucking accidents, premises liability, commercial business disputes and real estate and homeowner association matters. Tim has been selected for inclusion in the SOUTHWEST SUPERLAWYERS (r) every year since 2007 for insurance coverage. 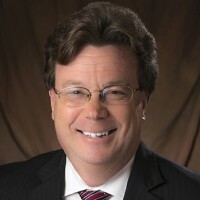 Mr. Hyland has also been named one of the top 50 lawyers in Arizona by SOUTHWEST SUPERLAWYERS (r) every year since 2011. Tim was also selected by BEST’s as a top lawyer in insurance law from 2015 to the present. Further, Tim has been named as one of the Top 100 Lawyers in Arizona by AZ Business magazine from 2015 to the present. Tim has previously served as a Judge Pro Tem for the Arizona Court of Appeals. Tim is rated as an AV Preeminent Attorney. Tim has served in a number of volunteer activities both professionally and in the community. Such activities include: service as a Delegate to the American Bar Association House of Delegates; participation on the Arizona Supreme Court Committee on Character and Fitness including a year as its Chair; and service on the Arizona State Bar Board of Governors and the Maricopa County Bar Association Board of Directors. Tim has also served as a faculty member on several seminar panels both for the legal profession and in presentations to insurance clients. Tim is also proud to serve on the Board of Trustees of All Saints’ Episcopal Day School. Tim graduated with High Distinction in 1985 with High Distinction from the University of Arizona College of Law. Tim is a member of the State Bar of Arizona, the American Bar Association, the American Bar Foundation, the Maricopa County Bar Association, and the Arizona Association of Defense Counsel. Philip Gerard (Domestic Relations), and Timothy Hyland, Steven Plitt and Richard Woods (Insurance Coverage and Bad Faith, Insurance Defense) have been honored ten or more years by Super Lawyers. William Demlong, Timothy Hyland and Steven Plitt were included in the Top 50 Arizona Lawyers list by Super Lawyers.